SpeedSport Promotions : Historic Victory ! 19 year old Michael O'Brien scored a memorable victory at the Silvertsone International Trophy Meeting on May 17th. Still a novice, Michael claimed pole position, race victory and fastest lap driving with the style of an experienced professional. Our sister Merlyn finished in 6th.position driven by American Mark Draghicescu who ran as high as 2nd. before a late race spin delayed him. 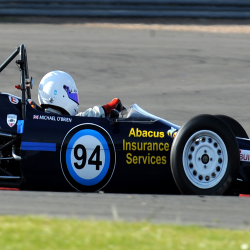 Next race in the Historic Formula Ford series is at Snetterton on June 8th.